Ben Spaulding summarises the goals he had set for mapping for the month of January 2016. Though he didn’t fully succeed in mapping for at least 15 minutes, but he still got some mapping done and his experiences are interesting none the less. In the city of Chefchaouen (the chief town of the province of the same name) in Morocco, a collaboration between young enthusiasts and OSM community led to a remarkable result. The project is described here in detail. (automatic translation). User oini writes a diary on re-tagging quadrant routes in Pennsylvania, USA. She also publishes another diary where she provides break-down of the retagged routes. Chris Hill (user chillly) from Kingston makes some critical remarks in his blog aboutisplay HTML differently. If you want to ensure your emails look great everywhere, you should test across as many clients as possible. the procedure used for mapping the schools at the UK 2016 Q1 Mapping Marathon. Belgian Mapper of the Month: ponci4520. Digitalcourage suggests to find one’s way (automatic translation) and for better privacy to prefer OpenStreetMap over Google Maps. Hetzner donated a more powerful server to JOSM developers. The move from the old to the new server will happen soon. Geraldine Sarmiento cartographer at Mapzen shows in a blog entry how different lines styles make different maps. Matt Amos writes at Mapzen blog about attempts to derive the relevance of railway stations from route and stop area relations. User marczoutendijk publishes quite interesting statistics about the Dutch mappers. The UNESCO Wikimedian in Residence is importing UNESCO data (ex. world heritage sites) to Wikidata. He would like to create a link between Wikidata and OpenStreetMap for each of the physical place inscription programmes. He has an idea about how it can be done and is asking for feedback and helpers, more information can be found here. The website of OpenStreetMap Mali has gone live recently. Metrolinx, “an agency of Government of Ontario to deliver mobility solutions”, tried to import address data from StatCan. The import has been reverted due to a lack of discussion at imports mailing list. Paul Norman points out during the discussion about the import attempt and its revert, that the license of StatCan data is incompatible. Joost Schouppe informs about a mapping party on 27 of February in Brussels. The mapping party focusses on infrastructure for homeless people. Ben Abelhausen reports on Talk-be mailing list about the progress of State of the Map organization (Brüssel, 23–25 September). Among others, they are currently looking for a good location for the social event and a company for recording/streaming the talks. France will arrange a SOTM-FR from 20th to 22nd May. A conference and workshop at the University Autónoma del Estado de México Campus Toluca. Managua became Central America’s first capital with a complete transportation map. weeklyOSM reported earlier and says “congrats” Felix! HOT publishes a bi-monthly newsletter. Pratik published HOT-Task-Map, a map generator that visualizes the footprint of all HOT tasks up to January 5, 2016, with a total coverage of about 7,449,759 sq kms. Missing Maps/MSF UK are looking for volunteers assisting with the development of a micro-mapping app. Free South-East Asia OpenStreetMap for Garmin. Mapzen enhanced the output of their route guidance, which also improves the routing on the main site. Martin Raifer published tortuOSMity, a project that displays the curviness of roads on a map. Mapper utack had problems running available OSM based maps on his old Garmin nüvi 205t. So he created his own and wrote a short crisp blog post about. Willem reports about a presentation he attended, where they spoke about Open Data and OpenStreetMap. User Geow points out that public data was released in South Tyrol under the license CC0 and are reachable via the platform Open Data Tyrol. An interesting article talks about “How to use the OpenStreetMap correctly?” (automatic translation). Different situations where OSM data or map can be used and how should they be correctly referenced, are discussed. How does share alike apply on generalized OSM data? Tobias Wendorff asks this question at Legal Talk mailing list. CycleStreets published a new app with a wide range of features dedicated to cyclists. The app covers North Staffordshire (including the urban areas of Stoke-on-Trent and Newcastle-under-Lyme). User ruthmaben writes about a tool called POI Finder she helped to develop. The tool uses the Overpass API to show all amenities in a given area or between two or more points. The result is a map which shows POI all around the world. Serious drawback: it works only for nodes, not for POI which are mapped on closed ways like buildings. The source code is available for download on github. Andrew Byrd reports about their progress with the exchange format VEX, which attempts to implement various advantages over PBF. Osiris is a new open source server for Indoor Maps based on OSM. 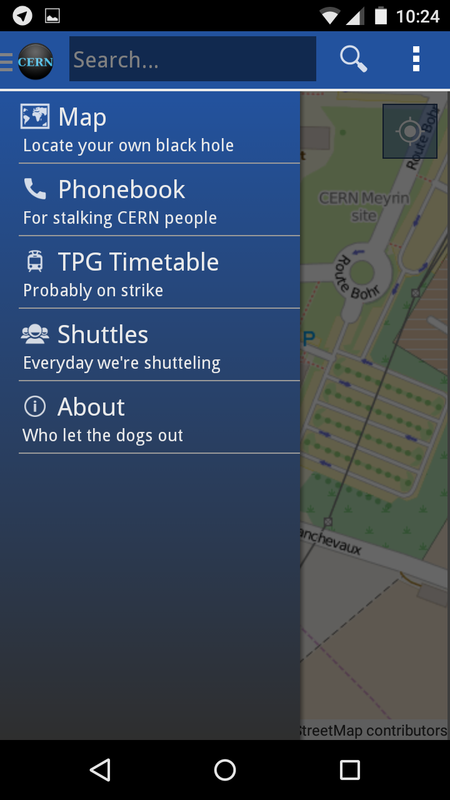 … the CERN app for Android and iOS made by Adrian Alan Pol, Andrea Giardini and Maciek Muszkowski. The app is absolutely useless for “common man”, but excellent for staff and visitors at CERN. Humorous (at least the Android app), it contains all the necessary information, including an OSM map exemplary attributed. The source code is available on Github. … the Five favorite maps from Stamen’s founder and creative director Eric Rodenbeck. … a French site that offers data sets for OSM data (per “category”) in France. … openstreetmap.cz, a website which is more than just a map? … the site TagFinder that features a semantic search for OpenStreetMap tags and terms? Christoph explains how the different satellites observe the different wavelengths of light. Norviz is a new company projecting graphics on physical landscape models. The guys from MangoMap have published a video tutorial as a beginners’ guide to QGIS. Read this to see how Google Mapmapker is used as a vector for fake sites appearing legitimate; obviously OSM can suffer from exactly the same problem. Note: If you like to see your event here, please put it into the calendar. Only data which is there, will appear in weeklyOSM. Please don’t forget to mention the city and the country in the calendar. This weekly was produced by Katja Ulbert, Nakaner, Peda, Rogehm, TheFive, Ziltoidium, bogzab, derFred, elpbatista, escada, jinalfoflia, malenki, mgehling, stephan75, wambacher, widedangel.